BrocElite is the most potent broccoli supplement on the market. 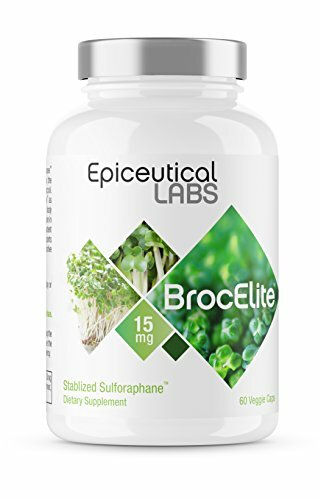 Made in the US, BrocElite is the first supplement providing Stabilized Sulforaphane, delivering 30-50 times more of this powerful ingredient into the bloodstream than any other product. Research studies have shown that taking the amount of sulforaphane in two capsules provides benefit in supporting your immune system, combating inflammation, and promoting detoxification. Each bottle has 60 capsules which is a one month's supply. SUPPORT HEALTHY INFLAMMATION RESPONSE TO PAIN: BrocElite works on pain two different ways - by blocking the pro-inflammatory NfkB pathway and by turning on the anti-inflammatory nfr-2 pathway. BrocElite is great of joint support. PROMOTE IMMUNE FUNCTION. Peer-reviewed scientific research shows that sulforaphane enhances bacterial clearance by macrophages and increases the activity of natural killer cells. In studies on aging, sulforaphane boosts cell mediated immunity and restores or delays the decline of cellular immunity that happens with aging. SUPPORTS LIVER FUNCTION. BrocElite works to support liver function by increasing glutathione production, increasing GST while decreasing AST and ALT. If you have any questions about this product by BrocElite Stablized Sulforaphane, contact us by completing and submitting the form below. If you are looking for a specif part number, please include it with your message. #1 Best CoQ 10 - Coenzyme Q10 the 'Miracle Supplement' Supports Every Cell in the Body. Heart + Energy + Stamina + Mental Focus + Aging. Ubiquinone is Essential to the Body. 1 Veggie Capsule Daily.